The old axiom says “there’s nothing sure but death and taxes”. We plan the best way to avoid paying the IRS by taking advantage of deductions and so forth, but we know very little about the cost mechanism of funerals, so are ill prepared to avoid being saddled with an expensive funeral when that unfortunate time arrives. 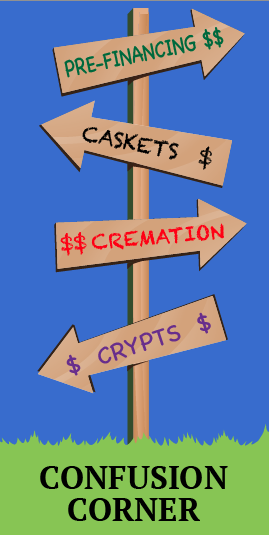 When a loved one passes away, you will be upset and grieving, and therefore will not be in the frame of mind to be worrying about these money decisions. Or your decisions may be affected by your state of mind at the time, causing you to overspend due to emotional reasons and making you more susceptible to a sales pitch. You may feel that no planning is necessary regarding your own death in the future. But you will be leaving your spouse, children, or other loved ones to deal with all of these decisions in their time of grief. But you may say, “Oh, my family will not need to worry. I’ve told them I just want to be cremated.” But do you know how much it will cost to be cremated? What kind of casket or container will be necessary for cremation? Will embalming be required? What about a funeral or memorial service your family may want to hold? What will be the details of that and how much will it cost? Just saying you want to be cremated and thinking that is all that needs to be done is avoiding the issue. There is a lot more to funeral planning, and even cremation, than you probably know about. There are many decisions to be made, and questions the funeral director will ask that you may never have thought of, because you are not familiar with all the different issues, products, and services that make up a funeral, cremation, or burial arrangement. Learning about, or at least becoming familiar with, all of these components is important for you and your family, and it is easy to do. Then, when the time comes, you will already have in mind what you feel would be necessary or desirable for you to purchase at the time of a death and what you feel you or your loved one would not need. You will be able to clearly tell the funeral director that you want this, but do not want to pay for that, because by learning about funerals, you will already have the answers to most of his questions before they will be asked. You will be able to think more clearly about this purchase in time of grief, because you are familiar with it. You will be better able to resist sales pressure and overspending when making funeral arrangements for a loved one. You will be able to write down exactly what your wishes are, and if you do a little price shopping, you will be able to calculate approximately how much this may cost. Then you can even, in some fashion, set aside money to pay for it if you wish, so that your loved ones will not be financially burdened. You can also pre-finance funerals or final disposition needs. Fortunately there are easy and inexpensive ways to learn what you need to know about funerals and funeral planning from an independent source. Mike Boyd, a non-practicing funeral director has written a book, “How to Bankroll a Funeral Without Breaking the Bank”, which is available from amazon.com. Click on the Funeral Planning Workbook tab for more information about the book, and take time to browse this website for more funeral planning tips.